We are in the oceanside parking area of Kahala Mall Shopping Center across from Long’s in the tan five-story Office Tower. H-1 to exit Waialae Avenue. 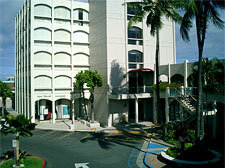 Right on Hunakai St. then left into the 2nd entrance of Kahala Mall. H-1 to exit Kilauea Avenue. Turn left at the light then turn right at the 2nd entrance into Kahala Mall.